This July, Spider-Man returns to the silver screen in his first Marvel Cinematic Universe solo film, Spider-Man: Homecoming! Mad Engine commemorates the new film with four new t-shirts that feature the film's logo and images of the friendly neighborhood wallcrawler! 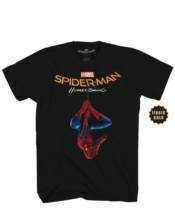 Perfect for summer convention attire or wearing to the movie premiere, add these Mad Engine t-shirts -- 'Accidentally Awesome,' 'City Hanger,' 'In the Light,' or 'Home to NY' -- to your wardrobe to show your love of Spider-Man and anticipation for Spider-Man: Homecoming! SPIDER-MAN VOL.18 (#181-192) SPIDER-MAN VOL.18 (#181-192) DM VARIANT ED.